You just walked into a smokey saloon. The bar is full of dusty ranchers. Girls with feathers in their hair wander between tables. And there, on your left, the gambling tables. Finally! You've been all over this stupid state looking for the best re-enactment town there is. At long last you may have found it! As far as you can tell, aside from the clear tourists, everyone is in character. No digital watches peeking out. No signs of cell phones. No modern white tube socks. This is the place you were meant to be. You can feel it in your bones. You were meant for the Old West. What else could possibly explain your desire to ride horses, gamble, and drink at noon? So here you are. Among your people. In your element. You've been training for this forever. It's time to gamble with the pros. Hey! Maybe if you're lucky, there'll be a bar fight! You don't want to brag, but you've been practicing smashing stools and home and you think you could handle yourself pretty well. There's just one last thing before you enter this Wild West gambling group. The proper attire of course! For example, our The Gambler Costume has just the right details. A poplin jacket with sewn-in brocade vest. A shirt front and pants, not to mention a satin bow for the neck. 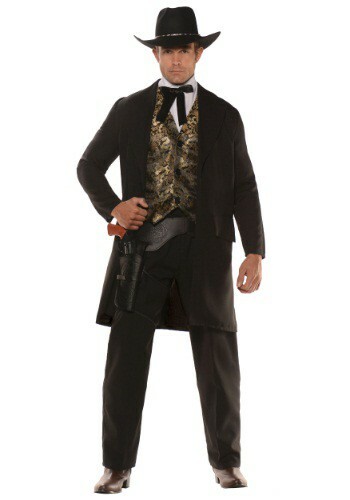 Just get yourself a good holster, revolver, and hat, and you'll fit in with the best of them! Now show that card table how it's done.